The Supersonic Wind Tunnel shown after some upgrades. 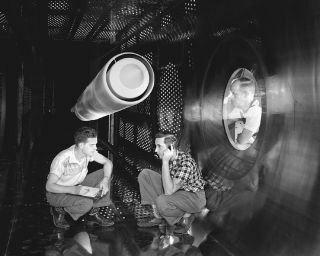 In this historical photo from the U.S. space agency, the 8ft x 6ft Supersonic Wind Tunnel Test-Section on July 31, 1957, showing changes made in Stainless Steel walls with 17 inch inlet model installation. The model is the ACN Nozzle model used for aircraft engines. The Supersonic Wind Tunnel is located in the Lewis Flight Propulsion Laboratory, now John H. Glenn Research Center.